Soviet Red Army Tankovy Battalion (Mostly Fearless, Conscript). 1 Battalion of 8 Katyushas and DShk AA MG's ( Fearless, Trained). Mission:Surrounded. 2 objectives are placed. Both defenders and attackers start in prepared positions. Attacker wins by holding either objective. Defender wins if no attackers are within 16 inches of an objective turn 6. Both sides start with all troops on the board. Attacker must have units in both deployment zones. 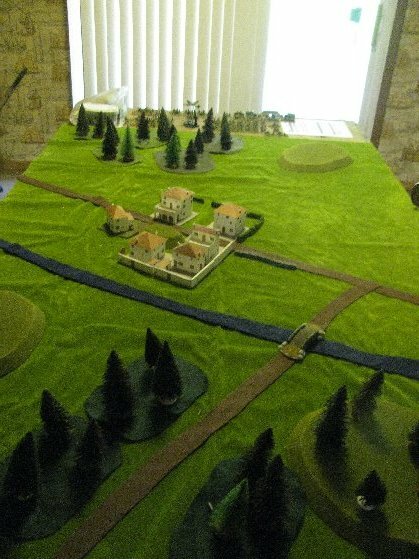 Large pieces of woods and some hills populate the north and south edges of the board. The medieval walled town of Dimshizak is in the center. There is a stream running from east to west on the north side of the board. The board from the north edge. The medieval walled town of Dimshizak. The board from the southwest corner. Looks like a great defense if the defender gets the east side to deploy in. The defender occupies the center 2 feet of the long side of the board. The attacker deploys along both short edges of the board. This is one of those things I love about this game. The board can be set up for for ideal defense one way, but the mission throws you a curve ball. In this case the mission rolled was "Surrounded", and while a walled village may seem like an ideal defensive area, there is just too much company that needs to deployed, and a lot of open ground around the village to put it in. The T-34's and the SU's would attack from the north, while the Lend Lease Shermans and the Katyusha's would come in from the south. The Soviets deploy 5 T-34's and 4 SU-122s on the north edge. German 88's are on the west edge. Mortars and PaK 40's on the east. Lots of grenadiers in the open defending the "mini-uber-Koningstiger"
While crammed in the south west corner are 10 Lend Lease Shermans, 8 Katyushas, and supporting teams. The Germans have triple firing 88's dug in and at the ready, that can strike at the Soviets no matter from where they approach. Kapitan Koning put down is binoculars. The situation looked about as the briefing had informed him. The Germans have established a hard point and would fight for Dimshizak. Not that they were given much of a choice, by being surrounded. The objective here was one of eradication, not of finesse. The new Commissar expressed an interest in the miniature Bengal Tigers that seem to litter the battlefields recently. Koning could see two of them here, though it seemed like the Bosch tried to scuttle one in a pond. So much effort to create these tiny replica's, and to what end? Some kind of deception plan to try to convince us there are panzers here? If so, that would only encourage our attacks. We can never destroy enough panzers. Now if only we had more ammunition for the rockets. Koning would be happy to "plow the fields" here for a day or two before the assault, but winter is coming, and we need to capture as much ground as possible before General Mud slows things down. Soviet tanks close in from both sides pincering the western objective. The T-34's took up positions along the wood-line. The combined forces focused on the 88's as they were not concealed in their location and took out one, along with its command staff. The 88's failed their motivation and abandoned their other gun. A good beginning. The PaK's replied, killing 5 Shermans in one volley. I cannot take another volley like that again. The T-34's, faced long range fire from the sIG 150's and the Nebelwerfers, with the results of one tank bailed. The Luftwaffe scrapped together a couple of Stukas, which raked the SU Battery, destroying one. The T-34 company is a bit small, with only 5 tanks. So I will use them primarily to pin and distract the German forces on the east side of the town. Surprise! The PaK 40's were hiding out in the open. The Soviets get very lucky on the opening turn, killing a triple firing 88 and its command team. The remaining 88 crew abandoned their position. But the PaK 40's just ruin the Company of Lend Lease Shermans. 5 tanks are destroyed and one is bailed. And a Stuka bombing run claims an SU-122. Turn 2:My Shermans can't stay where they are, so Kapitan Badinuff lead as many as could follow off to the flank of the PaK 40's Between shooting and assaulting, the Shermans managed to destroy two of the weapons. The remaining PaK's, now pinned, did not manage much this turn, only bailing a Sherman. The Luftwaffe, took another bombing run on the SU's, destroying another one. The German Mortars followed the rocket contrails of the Katyushas, fired back, destroying one, and pinning the battery. A couple of Shermans flank the PaK -40's. Pinning them with MG fire before assaulting. The Stukas claim a second SU. The Germans are prepared to defend the mini-uber-Koningstiger. Not a lot of shooting here. With the menace of the PaK's and 88's removed, the T-34's left their wood-line to assist on the final assault on the objective. The remaining German AT Assets were on the wrong side of town to help. The Germans start redeploying their Grenadiers from east to west in an attempt to hold the objective. The T-34's rake the redeploying Germans with machine gun fire. While the remaining Sherman tanks rolled forward to the objective, assaulting and killing all but one team of the defenders, who fled into town. The German forces redeploy in the for a counter assault, but they don't have the speed. In the end is is a Soviet 6-1 win. The remains of the 1/307 Tank Battalion take the objective. Then both the T-34's and the Shermans take up positions to defend the objective from all comers.